Drew Storm Graham etches tiny, iconic skylines onto his reclaimed whiskey barrel stave bottle openers. 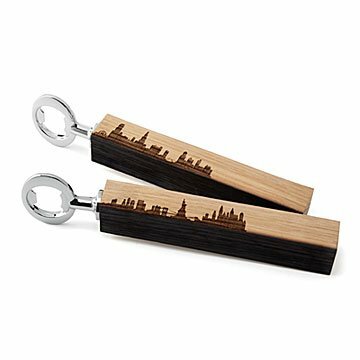 Toast your beloved burg without saying a word when you crack a beer with Drew Storm Graham's city skyline bottle opener. Starting with reclaimed whiskey barrel staves, he cuts, drills, and lacquer-finishes the wood, etching the tiny cityscapes on it with laser. A commemorative groomsmen gift, an iconic man cave accessory, or a tribute to a much-missed city of memory, Drew's miniature metropolitan masterpieces give even rural-brewed beers a bit of urban edge. Handmade in Denver, Colorado. This was a great present for a friend of mine who lives in Atlanta and is a big beer buff. I wanted to find something that was somewhat unique but also was a practical item he could use. When he received it, he told me that he was extremely impressed with how clean and detailed the design was, and it was something he had never thought to look for.